2011 is the year of Till Eulenspiegel – 500 years ago the story’s about Eulenspiegel first went to print. Several republications and translations made it Europe’s most read book of folk tales. The German Federal Republic pays homage to the jester searching for the truth with a specially minted 10€ coin. Boyan Karanjuloff and actor Michael Dreesen make alive the surprisingly relevant world of the famous rogue in a staged reading. 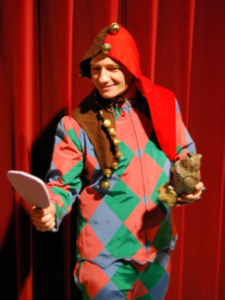 In the dramatic reading “Im Narren liegt die Wahrheit” (Only the jester speaks the truth) Michael Dreesen presents a good selection of the stories and changing perspectives he acts as Till Eulenspiegel who in his jester suit forges links between to the present day. Following the tradition of the intermezzo, Boyan Karanjuloff adds valuable musical accents that allow for contemplation. Tickets for the staged reading conceptualized by Dr. Thomas Hirthe are sold via the mbm-management. Please send a mail to info@mbm-management.de or call: +49(0)7531 3 69 98 47. Auf der Seite „Pressebereich“ stehen exklusiv für Journalisten und Veranstalter verschiedene Bilder und Textdateien in unterschiedlichen Dateiformaten zum Download bereit. Wenn Sie ein Email an mail@boyankaranjuloff.de senden, mit genauer Beschreibung des Grundes für den Download, erhalten Sie umgehend ein Passwort, mit dem Sie 14 Tage lang Zugriff auf die Inhalte diese Seite bekommen. Exclusive option for journalists and promoters: Under the category „press area“ you can download a number of images and texts in different formats. Please send an email to mail@boyankaranjuloff.de stating the reasons for your wish to download the files and you will immediately be sent a password which you can use 14 days to access the page. Eine vollständige Liste finden Sie unter "Termine"